Obama’s Executive Order for DREAMers was challenged in the courts and deemed lawless. To issue a pardon is a direct slap in the face to our judicial system and the American people. This would also be an obscene abuse of power knowing the courts have ruled against him. He would clearly be acting in defiance of the law. 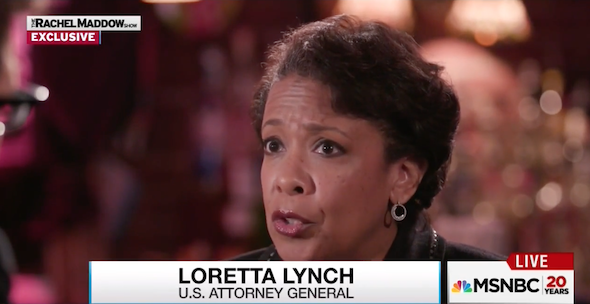 While Lynch appears neutral even suggesting the incoming admin needs to keep an open mind, you can be sure she is looking at the “process” on how to make a pardon for a group legal. DREAMers are ILLEGAL ALIENS, not undocumented immigrants, who do not have a legal right to be in the US. NO ONE cares how or who brought them here, because they too are here illegally. No one cares about how upset people are about the potential act o mass deportation under the Trump admin. We are a nation of laws, we do not reward bad behavior. They should be sent back to wherever they came from along with the rest of their family. The only ones breaking up families, are the families themselves! Those who are here legally choose to stay while others are sent back. So please stop with the “breaking up families” nonsense.